Caribou Country Adventures is located 24 miles North of Duck Lake on Bulloch Lake, situated on the Nejanilini River System. Famous for its Historic Hudson Bay Trading Post, the camp also borders the Baralzon ecological preserve. Bulloch Lake lies in the middle of the Qamanirjuaq caribou migration path where for centuries man has hunted these majestic animals. Stone points dating back hundreds of years have been found at the very same caribou crossing we hunt today. This land is home to ptarmigan, wolverines, wolves, black bear, moose and even the odd polar bear that wanders from Hudson Bay. If you enjoy fishing, the lake provides large northern pike, lake trout and arctic grayling can be caught in the nearby Wolverine River. This land holds unique scenery; beautiful sand eskers stretch along the lake shores. The northern lights are spectacular to view while enjoying the serene quiet of the night. You can imagine the indigenous people that lived in this area long ago dancing to their drum beat after a day’s hunt while the northern lights danced along with them. Booking a hunt with us will provide you with a unique once in a lifetime experience. You will be exposed to Northern Canadian wilderness hunting at its best. Our hunt success rates are at an industry high of 90%. Since obtaining the camp in the year 2000, many record book animals have been harvested. Our Manitoba hunters need only bring their bedroll, personal hunting gear, and hunting license. 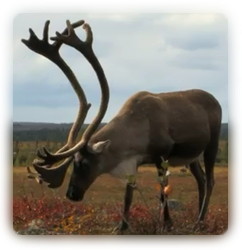 Caribou Country takes care of the rest including home cooked meals, flights from Thompson, Manitoba and the best caribou hunting experience in the North! Although our hunts are semi guided you will find we have time to assist each guest in our camp. If you choose, you are more than welcome to brave the tundra on your own. Whatever your idea of a dream hunting experience may be, you’ll be sure to experience that and more with Caribou Country Adventures Inc.